I had so much fun making today's project. I used several different techniques. I just LOVE the way this card looks. I used Chocolate Chip, Tango Tangerine, and Very Vanilla card stock. My Big Shot was a huge help on this card. I layered the Top Note off center so that I could keep the perforated edge on the top piece but still get the layered look. What do you think of that? I grabbed my Small and Large Oval punches for the sentiment. Everything on this card got beat up something awful. I had my DH wad up the Very Vanilla pieces and one of my children tore the edges of the card base. I used the direct to paper technique for the background on the base and on the main image. "We" were going for the vintage look. 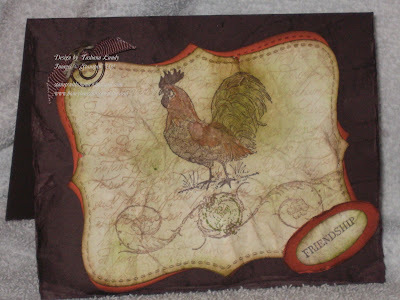 Oh, I guess I should tell you that I used the Level 2 Hostess set Rustic Rooster. This gorgeous set will only be available until the end of June 2009. Host a workshop in June and you can get all kinds of goodies....What kind you ask.....well.. Note: If your personal order reaches any of the totals mentioned above, you will still qualify for the hostess benefits and the special offered by me. really love what you did with this set!